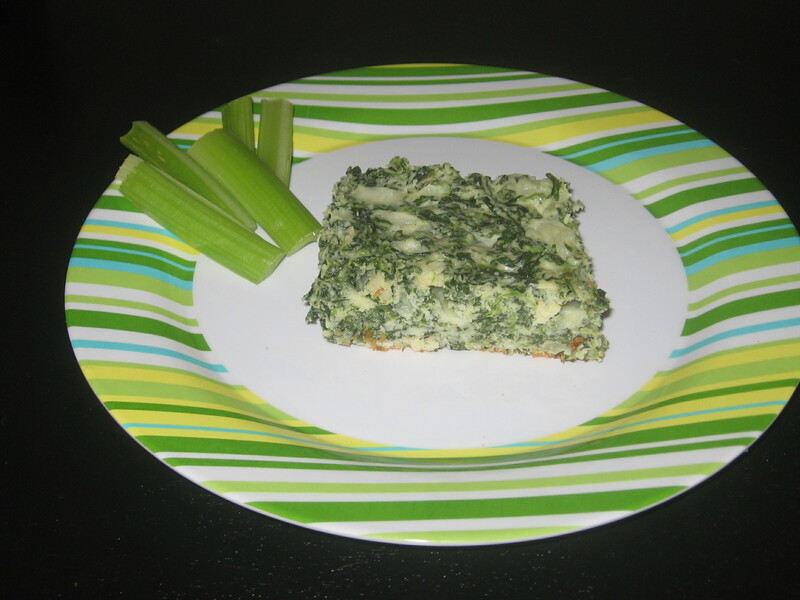 I’ve actually been making this recipe for spinach pie since I was a teen. It comes from my friend Debbie and her mom. I have no idea if her family still enjoys it but it’s definitely a favorite in my house. My plan was to go the summer without making it because I try to keep the oven off as much as possible. That and I figured I’d wait until my son gets home from his travels of Europe since it’s a favorite of his. But I couldn’t wait that long. This is not a recipe for quiche or spanakopita. This recipe is a toss all ingredients into a bowl, mix together and toss it into a baking dish kind of recipe. At this point I barely measure the ingredients and often switch them out. I have used a variety of chopped vegetables and cheeses but the basic recipe is still my favorite. I actually couldn’t find my hand written recipe book and worried that I would forget an ingredient. I googled spinach pie and Bisquick and found so many recipes. Many were similar but not the same. The proportions of the ingredients didn’t sound right to me, as if it would be too dry. A few had cottage cheese which just sounded awful to me but must taste good to someone. I’m happy to say my recipe book was found but for my own sake I need to get this recipe online so I don’t lose it again. This recipe goes into a 7″x 11″ pan nicely. If you want to use a 9″ x 13″ pan use add another 1/2 recipe and it will be fine. When I do that I often add chopped mushrooms or a box of frozen chopped broccoli instead of more spinach. I also love shredded carrot in this but some of my family members disagree. For the cheese I often add some feta and at times I’ve used different types of cheddar but the Italian cheeses are my favorite. Mix all ingredients in a bowl until well blended, pour into a greased 7″x 11″ pan and bake at 350 for approximately 30 minutes until it is well set and is just starting to brown at the edges. This is a great on the go type of meal. I often take the leftovers to work and pop it in the microwave for just a minute. Enjoy! Here is another great party recipe. I made several batches of this for my mom’s birthday party and they were a big hit. There really is no right or wrong way to make this recipe. Every single batch was a different combination of veggies and cheese and each one was great. I think my personal favorite was with sundried tomato and jack cheese but the green onions and mushrooms with swiss cheese was also a hit. I made batches of them for weeks prior to her party and stored them in the freezer. Several people asked for the recipe at the end of the party. I think they would also go well on a brunch menu. Combine cracker crumbs and melted butter. Divide crumbs among mini muffin tins that have been sprayed with a nonstick spray. Divide cheese evenly over the cracker crust. Saute veggies until just cooked in a little olive oil. Cool, and then divide evenly on top of the cheese. Beat eggs; add milk, and seasoning. Pour by spoonfuls on top of the veggies in tins. Fill about 2/3s full. Bake until set, about 15 to 20 minutes. Do not over bake. This recipe can be cooked in advance and frozen. Reheat in 350 oven 10-15 minutes before serving. This recipe is great after all the holiday rushing around and extra cooking. It’s a quick throw together recipe with no true right or wrong way. I make several variations depending on my mood and what’s in the house. For my husband I always throw in a little grilled chicken which I buy the frozen variety. This way i just grab a handful, defrost them and basically deal with on a minimal level. His also go in a separate pan. For my son I buy the largest soft tortilla’s because that fits his appetite, but please buy the appropriate size for your appetite. He will eat 2 large enchilada’s and I will eat a half of one typically. For all of the ingredients use as little or as much as you want. The only specific part of the recipe is making the sauce which takes about 2 minutes. This is almost too easy to call a recipe but is a dinner we all look forward to. Spread refried beans down the center of a tortilla.